Liver is the largest internal organ in the body. It helps metabolize fats, detoxifies environmental chemicals, produces biochemicals necessary for digestion, and breaks down hemoglobin, insulin, and other hormones. Plus, it is responsible for cholesterol synthesis, protein synthesis, and breaking down of toxic substances. 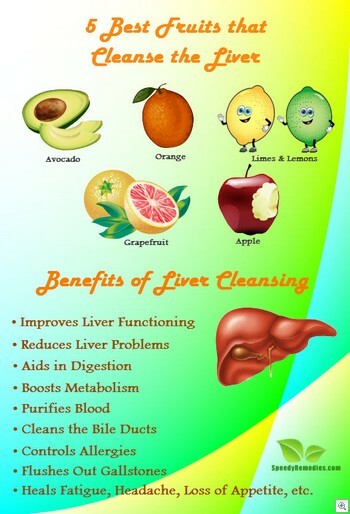 Thus, it is essential to cleanse the liver to help it perform its functions perfectly. Liver cleansing helps in the detoxification of alcohol, environmental pollutants, tobacco smoke, caffeine, food additives, pesticides, etc. In addition, it clears the blood of drugs and other toxins. Healing symptoms like fatigue, headaches, nausea, loss of appetite, etc. However, liver cleansing cannot be expected to cure liver damage caused by autoimmune diseases, excessive alcohol consumption, etc. Furthermore, it can cause side effects such as headache, diarrhea, vomiting, abdominal cramps, and so on. Individuals suffering from diabetes, low blood pressure, and heart disease in particular, are advised to consult their doctor before opting for a liver cleanse procedure because it involves fasting. It is worth noting that liver is a unique organ in the body which is capable of regenerating itself because it is able to replace the damage tissues with new cells rather than scars. Complete regeneration though, can be prevented due to agents like alcohol, drugs, and viruses. Liver diseases include conditions like jaundice, fatty liver disease, hepatitis infection, cirrhosis of the liver, chronic liver disease, and liver cancer. Most liver problems are caused by alcohol, drugs, and viruses. Immune system, genetic, and metabolic abnormalities can also cause the same. Grapefruit contains compounds that stimulate the production and activity of enzymes that aid in liver detoxification. Moreover, it helps clear out carcinogens. The fruit is good for your overall health too because it lowers LDL cholesterol, prevents kidney stones, and protects against certain types of cancers. This acidic fruit also helps you lose weight. When taking grapefruit for a liver cleanse though, it is suggested to consult with your doctor as it can interfere with some medications. Oranges and tangerines are a good source of vitamin C, vitamin E, vitamin B1, vitamin B3, vitamin B9, and caroteniods. Moreover, they contain magnesium, copper, and zinc. All these nutrients are required to support proper liver health. Deep bright colored fruits and vegetables contain phytochemicals that work as healing antioxidant for a liver flush. Avocado contains dietary fiber, healthy fats, and vitamins like B vitamins, vitamin C, and vitamin E. These nutrients are good for overall liver health. Avocado produces an antioxidant called glutathione that boosts the liver’s cleansing ability. In addition, this fruit is beneficial for repairing liver damage and protecting the liver from a powerful toxin (galactosamine) that causes liver damage. Simply having one or two avocados a week is considered good for liver health. Apple or apple juice is good for a liver cleanse because it is useful for relieving toxins from the body. In fact, during a liver cleanse diet, it is often recommended to drink two glasses of organic apple juice every two hours, for two days. Apple juice contains malic acid that helps dissolve gall stones. Limes, lemons, and other citrus fruits stimulate detoxification and balance pH levels in the body. Being high in vitamin C, they help the liver flush out fats and biochemical waste from the body. Furthermore, intake of warm water mixed with fresh lemon juice or lime juice, early in the morning helps stimulate the production of liver enzymes so that it can eliminate . There are certain detox diets are popularly used in the process of liver detoxification. These diets include Fat Flush Diet, Raw Food Diet, Liver Cleanse Diet, Master Cleanse or Lemonade Diet, and Martha’s Vineyard Diet Detox. A detox diet for liver cleansing can also be accompanied by saunas and exercises that promote sweating in order to remove toxins from the body. In addition, you can go for an edema after completing the liver cleansing process. It is usually suggested to perform a liver cleanse about twice a year. Stay away from processed and refined foods such as chips, French fries, pretzels, white bread, etc. Avoid refined sugars, too. Do not consume alcohol; limit caffeine intake as well. Eat dark green vegetables such as broccoli, spinach, kale, cabbage, and so on. They are rich in plant chlorophylls that help remove environmental toxins. Plus, include beets and carrots in your diet as they contain beta carotene; it stimulates liver cells. Garlic is also considered excellent for liver cleansing because it activates liver enzymes. Opt for organic fruits and vegetables because as they have more antioxidants as compared to the conventional produce.